This SNMP trap was being triggered every now and again. Like many SNMP messages, there’s not always anything useful within them to help explain what actually happened. In my case, a scheduled reboot caused the iLO on an HP BL460c Blade to trigger the SNMP alarm, which HP call “Server Reset Detected”. 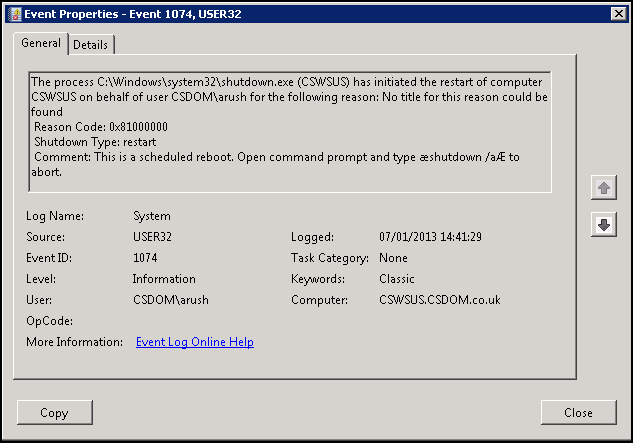 This will alert any logged on users that the computer will reboot in 5 mins, and can be aborted by running shutdown /a. Lastly, create a scheduled task to run the batch script at the required time. Event IDs 6009, 6005 and 6013 will also appear in the System log, with a Source of EventLog. The precise stop and start time can be found in Event IDs 13 and 12, in the System log, with a Source of Kernel-General. You use the excellent mRemoteNG software; possibly the best Remote Connections Manager in the world…and FREE! Unfortunately, sometimes there’s a bug which resets / deletes / clears your connection file each time you close mRemoteNG, so the next time you open it, all your connections have disappeared. The only thing not lost is the root folder with a name like mR|Export (20121211 20:07:53). A simple fix, but this one stumped me for a while. Hopefully this will help others with the same issue. If you want to open a specific connection file, you can create a shortcut and use the /cons: commandline switch. There really isn’t much Notepad++ can’t do, and just when you think you’ve found one, there’s probably a plugin for it. One example of this is JumpLists. I use them as much as possible, as I find it helps me work faster. With this in mind, I was always disappointed that Notepad++ didn’t have this feature built-in, so it was a pleasant surprise to find a plugin for this last week. 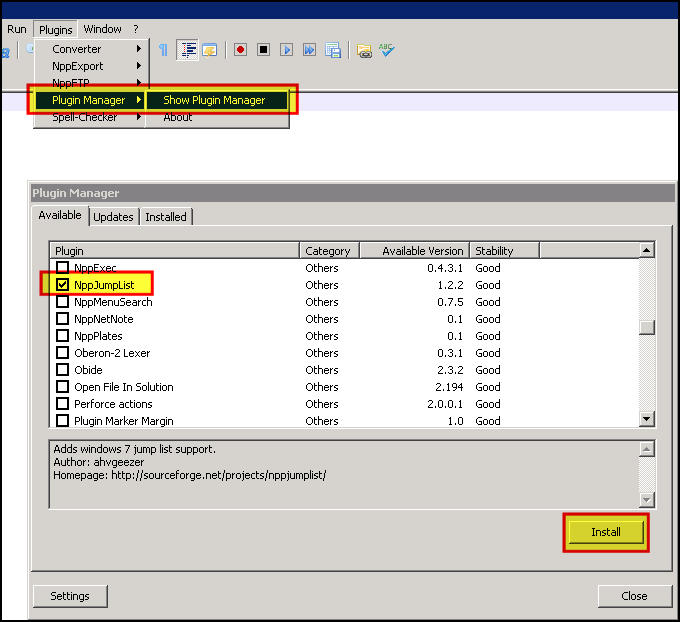 To install the plugin, open Notepad++ and navigate to Plugins > Plugin Manager > Show Plugin Manager. One of your HP 625 laptops will not boot up. There are no POST beeps and the screen is blank. The Caps Lock LED flashes continuously. This is what a helpful Support Guru called Chris (from Vantage Computing) did to fix it. Repeatedly tap the F8 key until you see the Advanced Boot Options screen. Logon as a local user. On the System Recovery Options screen select TOSHIBA HDD Recovery. Follow the on-screen instructions from here on. For me, it took about an hour to restore, reboot several times, and be on the desktop ready to configure and join to the domain.